Believe it or not, men love to live and spend in style. They like to flaunt their stuff, expensive or not, that doesn’t matter. Money and power drive all the guys. However, the ultimate thing any guy would want to have is a yacht of his own. In case you are one of them who dreams about living it big and would love to have a yacht or megayacht of your own, then have a look at these fantastic megayachts and megayacht concepts which will blow your mind away. Are you a sports freak? 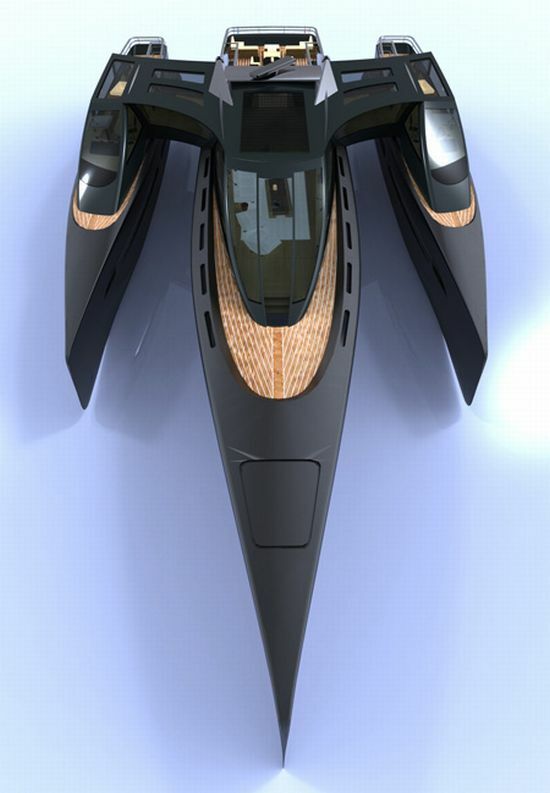 If you are, then you will be glad to know about the Superyacht – Strand Craft 122 which comes with a stunning supercar. With extremely artistic interiors, this sea creature is all set to cruise at a speed of 43 knots and get your pulse high on excitement. With vacations nearing, we are always compelled to think of a place that would give us peace, comfort, and a much needed respite from the mundane and hectic life. How about cruising on Infinitas Yacht? Away from the regular routine, this is a must for all those people, who are too busy to find time for themselves. The designer of Poseidon 180 definitely scores more numbers on the ranking scale for this exclusive yacht design. There is competition everywhere and so in the world of cruising. 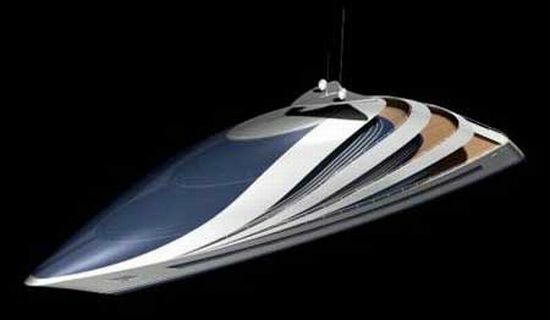 While you decide to invest a huge sum of $50 million, it better be nothing less than the impressive Poseidon 180. South East Asia and Africa have been popular tourist destinations for cruising for quite a long time. However, I feel that if you wish to move a degree higher on the enjoyment level, you need to check out Code X Yacht. It has all the amenities ranging from spacious interiors to LED touchscreen technology for the passengers to enjoy life on sea! Now this is what I call ‘Extravagance’! 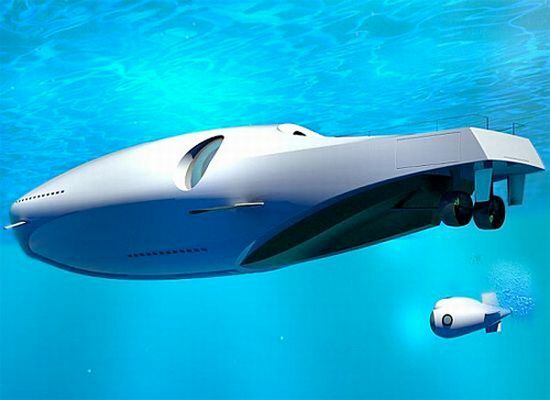 Undersea Yacht has a beautiful, luxurious, and contemporary design that nobody would want or like to miss out. It is like living life outside your ‘home sweet home’ yet enjoying the comfort zone miles away not just on the sea waters but underneath the water too. WHY Yacht is another exclusive design with a triangular hull formed by Wally-Hermès Yachts. It is an eco-friendly concept aimed at offering luxury, hi tech amenities, and durability to the travelers. According to me, it makes a wonderful experience of living outdoors without having to compromise on comfort! While we are in a holiday mood, we generally tend to forget the already disturbed environment and end up destroying it further. 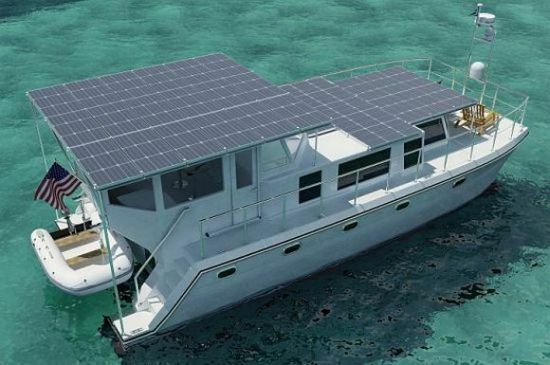 Why not look at alternatives such as DSe Hybrid, which is an eco-friendly yacht that runs using solar panels? 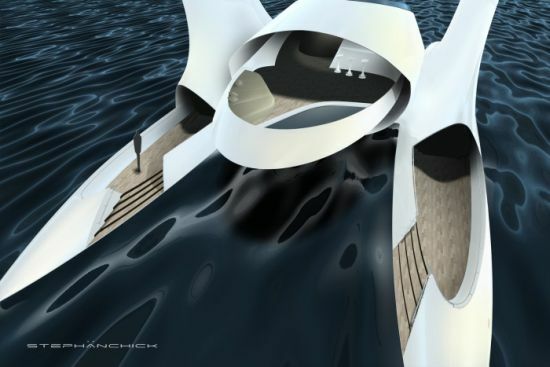 Though it cruises at a slow speed, the design includes a host of amenities for the guests to enjoy! Splendid, marvelous, and stunning – Like me, do you fall short of words to express the grandeur of Tribolis. 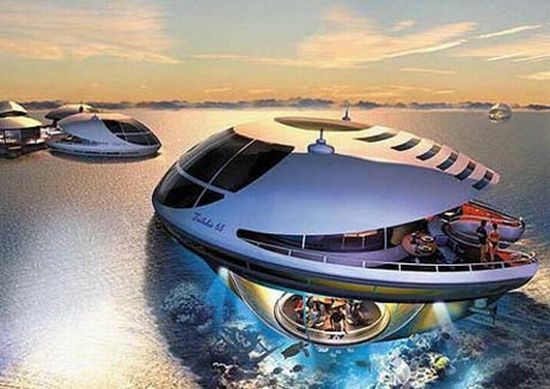 This UFO like yacht can be controlled using a Joystick, and is an ideal romantic place where you can spend some quality time with your spouse and experience serenity to its best. If you are one of those, who don’t find yachting to be exciting or interesting, take a look at Enso Catamaran. 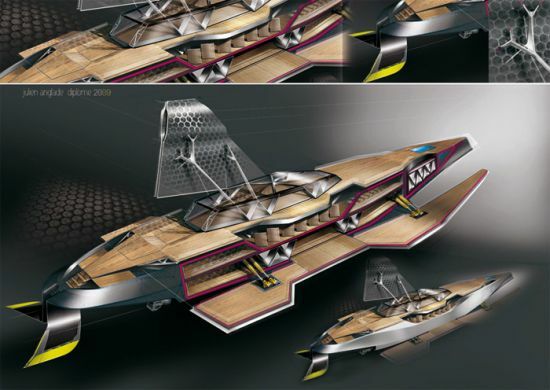 This yacht design is a sheer beauty with remarkable streak of adventure and sports to its design. Are you sure, you still hold the same opinion about cruising on sea? 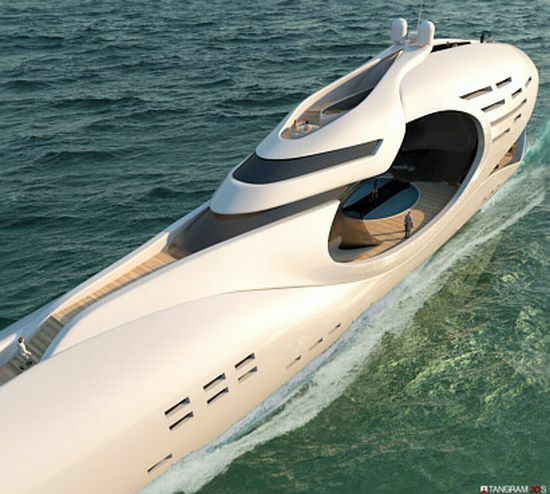 Those, who frequently travel by sea, will fall in love with this yacht design. 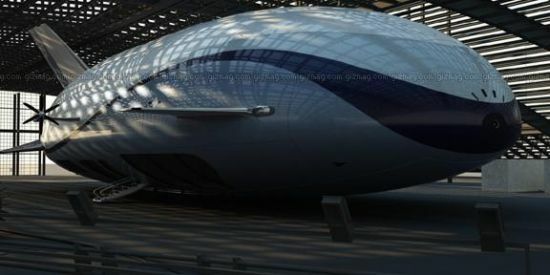 The artistic design looks similar to the jaw and eye socket bone structure of a gigantic aquatic animal, if there was any. Known as Oculus, this design simply represents the talent of the designer – E. Kevin Schopfer. Origami Yachts is a beautiful creation of Fabio Federici and probably meant only for those who understand the term ‘Aerodynamics’. You can make use of its multi-purpose deck, which closes its wings while navigation and opens up when you are ready to enjoy the bright sun! Isn’t it cool? Probably, what is essential for a builder to keep in mind while designing a yacht, are perfection in engineering, demands of the owner, and safety norms. 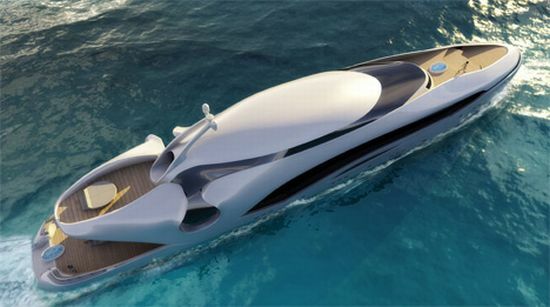 Riparian Yacht is a perfect example of powerful engineering coupled with classy design. If you are all ready to splurge your money on cruising, Riparian Yacht can be a great idea. 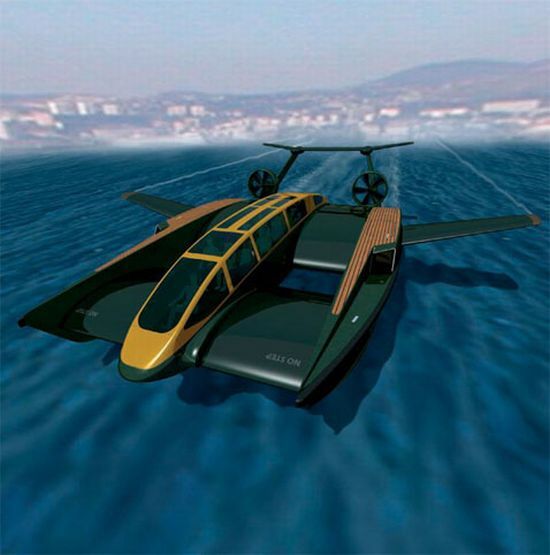 Another concept that is modeled to fly in the air and cruise on waters is ML866 Aerocraft. 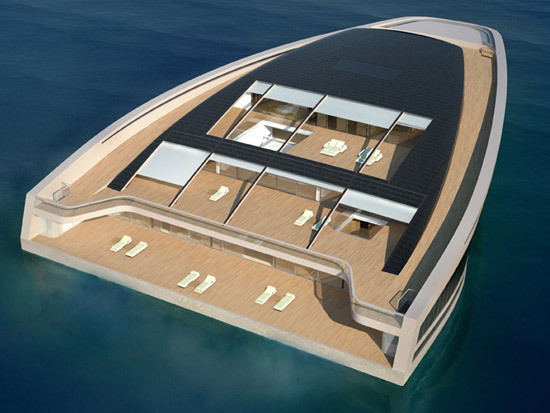 With an astonishing area of 5000 square feet, this yacht is just amazing! 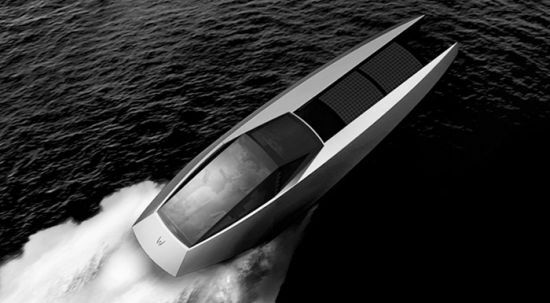 The yacht, which resembles a whale, can cruise at 120 knots of top speed. Does this resemble a space ship? Yes, indeed. But this yacht design is not just meant for the adventurous travelers – it can very well be of use to families, too. The highlight of its design is continuous travel ensured through SkySail at the speed of 24 knots and maximum cruising speed of 45 knots. At one point in time, we all have wished we had some power to move from one place to another in a span of a few minutes. But have you heard of a superyacht letting you accomplish this task? 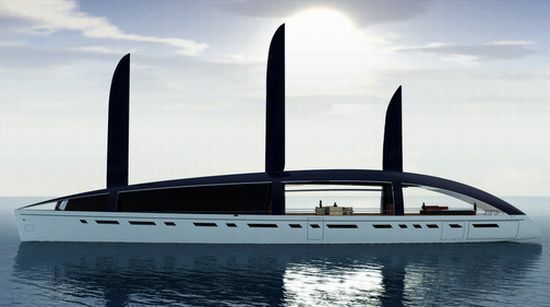 Well, Focus 21 France is the company that has designed a Superyacht that will fly on the waters. 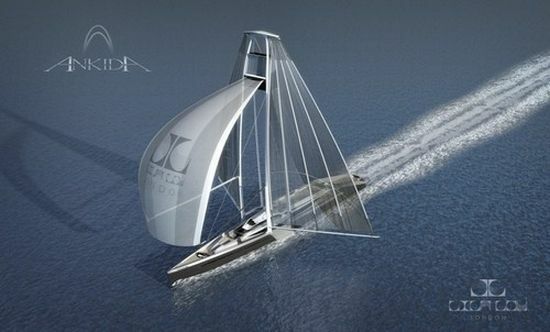 There are several fairs and exhibitions organized to display new yacht designs. But you must have not come across this particular yacht named as Ikkar Transforming Yacht. The yacht, which is in its developing stage is completely innovative and highly acclaimed concept, which will give you an all together new yachting experience aboard. Lila Lous Ankida Yacht is very similar to the conventional yacht models that were a big hit previously amongst travelers. With a beautiful sail supported by the mast, you only wish to relax on the deck of this yacht and see the sun setting below the horizon. Now, I don’t know how many of us (of course, the ones with more riches in the world) would really intend to buy this yacht. But it is worth a look at least. 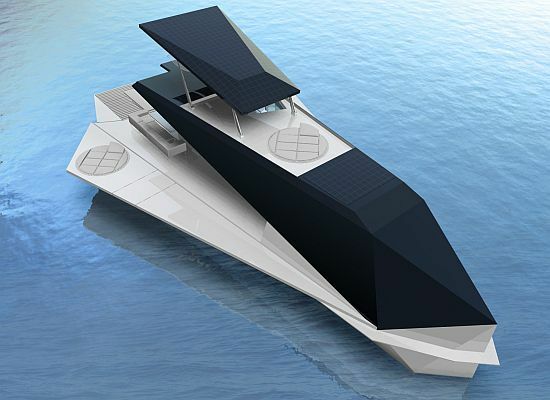 This 190 foot vessel has been constructed to run using solar power, wind, and hybrid marine power technology.